The application is open until January 20, 2017. Advances in technology for low-energy experiments together with further data at 13 TeV from the LHC will provide a new environment, requiring a reassessment of the focus of the field. The Scientific Program will cover the theory and experiment of a wide range of low-energy searches for new physics that provide unique and complementary information to accelerator-based searches, independent of potential discoveries at the LHC and future colliders. 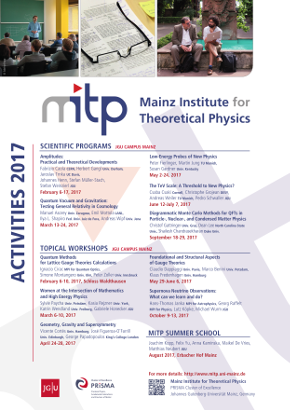 This Scientific Program will provide the opportunity to bring together the proponents of major low-energy experimental efforts to discuss the techniques, challenges, and progress and to incorporate leading theorists into the discussion of motivations and open questions. The major topics include slow-neutron physics, searches for time-reversal symmetry breaking electric dipole moments (EDMs), exotic effects such as light “axion-like” particles, parity violation, fundamental muon physics, and precision tests of SM radiative corrections. Theoretical participants will include phenomenologists with expertise in calculations of particle-physics and QCD effects in specific systems such as nuclei, atoms, and molecules; the aim is to compare and combine techniques, address specific crucial questions for the experiments and to analyze the impact of existing and proposed experiments on the theoretical picture. Participants will find synergies with Mainz’s research infrastructure and the opportunity to further develop long-term research activities with local groups.